If you are reading this, there are chances that either you or someone you know is suffering from hearing loss. It is of paramount importance that hearing loss is correctly diagnosed, because without proper diagnosis proper hearing loss treatment is not possible. You must have read the terms: Sensorineural hearing loss and Conductive hearing loss in articles; however, less are the chances that you know what they mean. This post will give you detailed insights into the types of hearing loss. In this hearing loss, nerves of the inner ear are damaged. There are tiny hair in the middle ear that convert sounds into electric signals that are forwarded to our brain. Sensorineural hearing loss is a state of hearing loss when these tiny hair get damaged and become dysfunctional. To put it simple, this hearing loss is due to damage caused to: the brain, inner ear or the nerves that carry signals to the brain. Unlike sensorineural hearing loss, sound doesn't enter into the ear as normal in conductive hearing loss. Understandably, the outer ear gets damaged in conductive hearing loss. Conductive hearing losses are mostly temporary, and they quite common while sensorineural hearing loss is permanent and it is very rare. It is a good idea to approach an audiologist for a hearing test to determine what type of hearing loss you suffer from. It will help the doctor give you appropriate treatment for hearing loss. He will also help you choose one of the best hearing devices for improved hearing. Frankly speaking treatment for hearing loss doesn't mean that hearing ability of your ears will be improved, but with use of hearing devices will improve the perception of sounds. 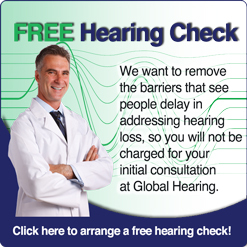 If you suspect that you suffer from a hearing loss, click here for a Free hearing test online.